6.30 points at 30 votes (rank 570). "Le Mans" is a car racing game where you need to drive as far as possible in a certain time. By overtaking other racers (which partially have a bit of an unconventional driving style, which does not make it easier) without causing a crash, points are added to your account (1000 points per 10 cars). If you reach more than 20.000 points before the time has run out, you receive further time units and you can go on driving. Next to the normal track you need to master driving on ice, in curves, at night and on motorways. If you crash you need to drive into the mobile garage (PIT), which is at the left roadside, which costs you valuable seconds. Additionally the number of cars overtaken until now is set to zero. The graphic shows the track scrolling from top to bottom from the bird's eye view. There is sound, music is missing. The cars and the track are designed very simple. At the right border of the screen are the speedometer and the point and time counter. Here also the number of cars that have been overtaken are shown. For the original game (cartridge) a paddle is needed with which the car can be steered very well, precise and above all, fast. 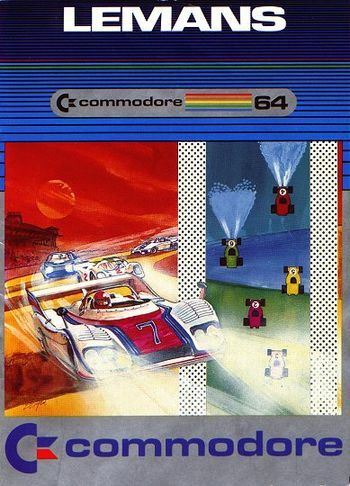 The car is in the original version controlled by a paddle and in the version of Nostalgia also by a joystick. By pressing FIRE you accelerate, by letting it go the car gets slower. You are awarded 2 points per meter that you have driven. AFter overtaking 10 cars without a crash you get 1.000 bouns points. The game is played dependent on time, if it is over you drive over the finish line, unless you have gained some extra time by overtaking. You get this extended time each 20.000 points. If you crash in the middle of the track you are automatically drawn into the box. So far so good, but unfortunately you are also drawn back towards the pit when driving out of it, which most of the time leads to further crashes. Solution: When driving out, press the fire button hard, this interrupts the guidance to the middle. If possible stay at the left border of the track as there is the PIT-Stop area and you do not need to drive through the whole width of the track. If you cannot pass two cars inside the narrow track part, you can let yourself fall back cautiously (be careful that there is no car coming from behind!). Then the cars are placed anew and most of the time you can pass! When you are in the box, the same cars pass you over and over again. This can make it hard to drive out of the box. So it is advisable to accelerate to the same speed before leaving the Pitstop area. Sledgie: "It is very good for a fast occasionally arcade race. In other respects it gets monotnouse after some time, as the tracks repeat themselves. Very good for highscore chasers. As I am not much of a car racing freak, I especially like the simple controls in Le Mans and play it more often than other games of this genre. I vote 7 out of 10." 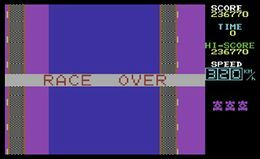 Guybrush: "In contrast to Sledgie I love racing games. I have also played LeMans many times although it is not really diversified. 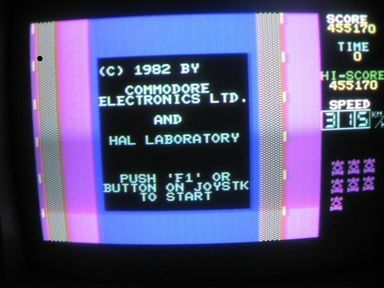 For the starting time of the C64 it is acceptable, therefore 6 points." Borna: "In 1982 this was just really great. I still remember, how I stood in the computer shop as a small boy and saw the cartridge - at that time it cost about 50 Marks." Stefan Egger: "Yes, Le Mans, I already played that in my childhood and therefore I like to play it time and again. A rather funny and partially annoying game..."
Fan version "Le Mans" with wheelchairs. There is a version of Le Mans, which is exactly the same game (also the bug? is there), however, the graphics of the cars have been swapped by wheelchars. Also the overtaken wheelchairs at the right are displayed with an own graphic icon. The whole thing is called "Wheelchair Race" and is actually harder than "Le Mans", because the wheelchairs have - as is generally known - no rear lights (you cannot see them in the tunnel). This version is - as fas as known - a "fanmade version" and was not released for commercial purposes. This page was last modified on 22 October 2017, at 19:33.